MSM, (methylsulfonylmethane,) is a natural anti-inflammatory and analgesic (pain killing) product. It is produced when DMSO (dimethylsulfoxide) is oxidized, but is also found in small quantities in horsetail (Equisetum sp. ), milk, fruits, vegetables, and grains. It provides a sulphur source for the synthesis of methionine by intestinal microbes and also appears to be a precursor molecule for cysteine synthesis. It is thus used in humans to treat many of the same conditions as the methionine derivative SAMe (S-adenosylmethionine), including pain, inflammation, allergies, arthritis, and the maintenance of normal keratin levels in hair, skin and nails. An emerging application of MSM is in the induction of cancer cell differentiation. MSM compares favorably to low doses of aspirin in its ability to promote the aging of tumor cells to the point that limits are placed on their lifespan and the number of times they are permitted to multiply. "The net effect of cell differentiating agents is to slow the growth or even shrink tumors..."
The net effect of cell differentiating agents is to slow the growth or even shrink tumors, as cancer cells begin to die off and are less rapidly replaced. How much experience is there with the use of MSM in pets? 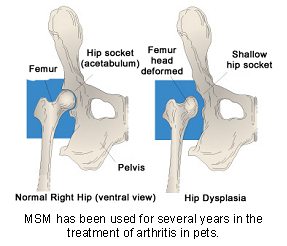 MSM has been used for several years in the treatment of arthritis in pets. What species of animals are being treated regularly with MSM? Dogs are the main species treated; cats may also benefit. Clinical trials of MSM are limited but encouraging. A clinically significant effect was observed on respiratory tract inflammation and function in humans. Clinical outcomes in animals receiving MSM for osteoarthritis are also encouraging. Where do I obtain MSM and do I need a prescription? Pet owners are cautioned against buying supplements without knowledge of the manufacturer, as supplements are not highly regulated and some supplements may not contain the labelled amount of ingredients. A prescription is not needed for MSM. Your veterinarian may have preferred brands of supplements that he or she will recommend.